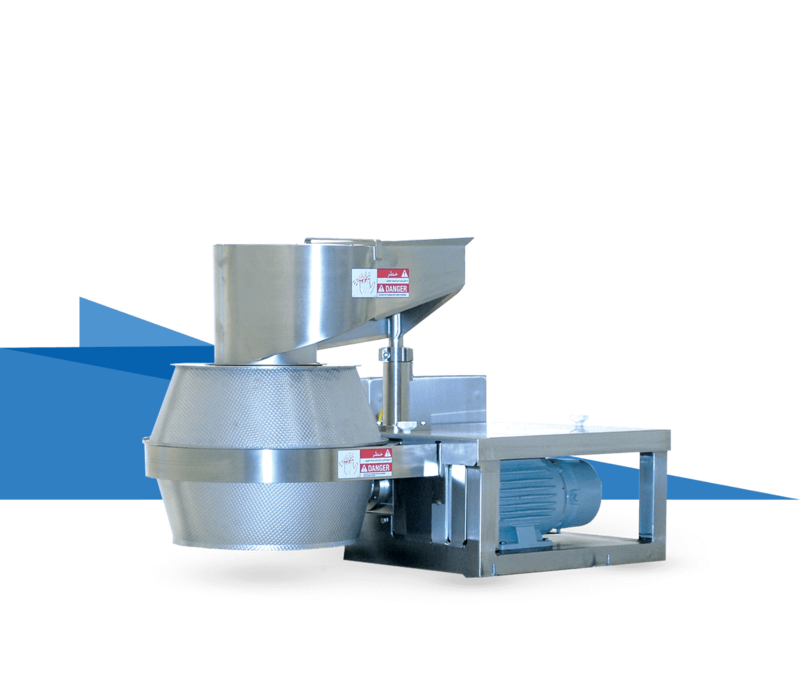 Model CC Slicer - Urschel Laboratories, Inc.
With a range of different cuts, this potato chip slicer is also ideal for various other food products, such as cheese, vegetables and nuts. Offers over a dozen different types of cuts including flat slices, "V" slices, new Flat-V® shreds, new Flat-V® slices, crinkle cut potato slices, strip cuts, full shreds, "V" shreds, oval shreds, wide oval shreds, crescent shreds, wide crescent shreds, and grating options. Available with 2, 5, or 10 HP (1.5, 3.7, or 7.5 kW) motor to fit your line. Specially designed disposable knives are inexpensive to replace and do not require sharpening. Accepts input products up to 4" (101.6 mm) in any dimension. New MicroAdjustable™ Slicing Head (SL-14) features 14 cutting stations that maximize slice engagement. 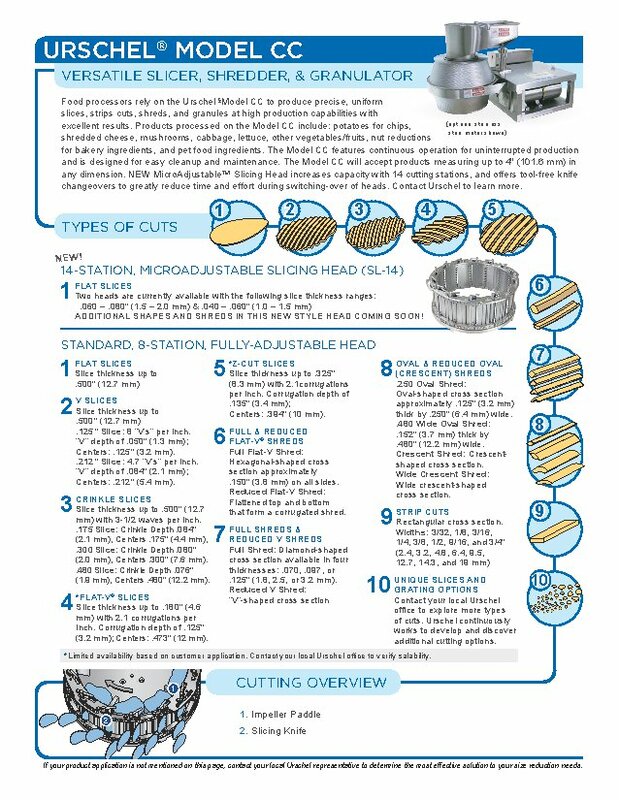 This increase in cutting stations delivers much larger capacities versus the standard, fully-adjustable 8-station cutting head. This new slicing design concept does not incorporate shims or shoes, and offers tool-free knife changeovers. Weighing in at only 35 lb (16 kg) with built-in lifting handles, the SL-14 is adeptly removed and replaced. Amplify your production with this new innovation from Urschel. 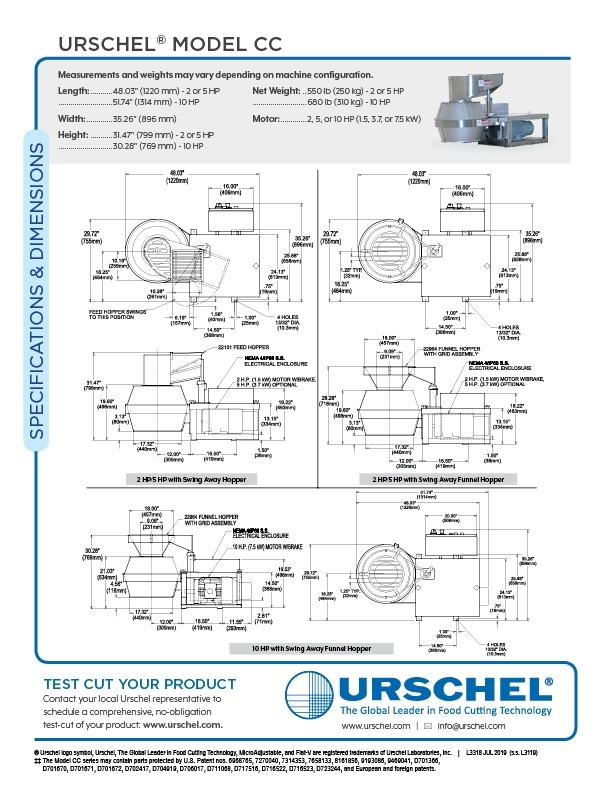 Food processors rely on the Urschel §Model CC to produce precise, uniform slices, strips cuts, shreds, and granules at high production capabilities with excellent results. Products processed on the Model CC include: potatoes for chips, shredded cheese, mushrooms, cabbage, lettuce, other vegetables/fruits, nut reductions for bakery ingredients, and pet food ingredients. The Model CC features continuous operation for uninterrupted production and is designed for easy cleanup and maintenance. The Model CC will accept products measuring up to 4" (101.6 mm) in any dimension. NEW MicroAdjustable™ Slicing Head increases capacity with 14 cutting stations, and offers tool-free knife changeovers to greatly reduce time and effort during switching-over of heads. § The Model CC Slicer may contain parts protected by U.S. Patent No. 5694824 and 7270040. 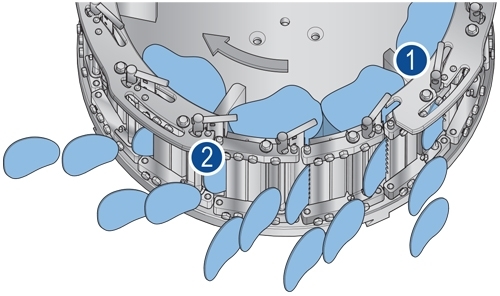 The cutting head assembly consists individual stationary cutting stations. Slices or shreds are produced as product passes each knife [ 2 ] in a smooth and uninterrupted manner. Length is controlled by input product size. Slice thickness up to .180" (4.6 mm) with 2.1 corrugations per inch. Corrugation depth of .125" (3.2 mm); Centers: .473" (12 mm). *Limited availability based on customer application. Contact your local Urschel office to verify salability. Slice thickness up to .325" (8.3 mm) with 2.1 corrugations per inch. Corrugation depth of .135" (3.4 mm); Centers: .394" (10 mm). *Limited availability based on customer application. Contact your local Urschel office to verify salability. Slice thickness up to .500" (12.7 mm). .125" Slice: 8 "V’s” per inch. "V” depth of .050" (1.3 mm); Centers: .125" (3.2 mm). .212" Slice: 4.7 "V’s” per inch. "V” depth of .084" (2.1 mm); Centers: .212" (5.4 mm). Slice thickness up to .500" (12.7 mm). Full Flat-V Shred: Hexagonal-shaped cross section approximately .150" (3.8 mm) on all sides. Reduced Flat-V Shred: Flattened top and bottom that form a corrugated shred. Full Shred: Diamond-shaped cross section available in four thicknesses: .070, .097, .125, or *.285" (1.8, 2.5, 3.2, or *7.2 mm). *Limited availability based on customer application. Contact your local Urschel office to verify salability. Reduced Flat-V Shred: "V”-shaped cross section. Oval Shred: Oval-shaped cross section approximately .125" (3.2 mm) thick by .250" (6.4 mm) wide. Wide Oval Shred: .125" (3.2 mm) thick by .375" (9.5 mm) wide.